Does YSL Touche Eclat have a dupe? The title of this post may appear laughable to some. After all, the world famous Touche Eclat by Yves Saint Laurent (£24) has been the make-up bag holy grail to women for years. It’s been coined the ‘Eight Hours of Sleep magic wand’ by make-up artists and beauty lovers alike, banishing tired looking eyes and instead leaving you looking bright eyed and bushy tailed with just a click and a swipe. I like to experiment with various concealers and am very open to trying out new things but despite trying out and loving various other concealers, (notably NARS Duo Concealer Palette £22 and MAC Studio Finish Concealer £12.50)I am yet to find one which gives me the wide eyed, awake look that I get from Touche Eclat. 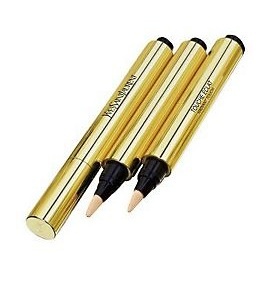 However, recently I have been trying out the Nip + Fab Eye Fix Brightening Concealer (£9.95), which I have found to be very similar in many ways to the beloved Touche Eclat. The first notable similarity is that of the packaging, which is a pen with a soft brush and a twist action to release the product. Like Touche Eclat the packaging is perfect for the convenience factor, simply throw it into your bag and use throughout the day for refreshing and highlighting tired make-up. What is more important though is what is on the inside. Nip + Fab Brightening Concealer is a 2 in 1 eye cream and concealer, with hyaluronic acid which hydrates and plumps and light reflecting particles that brighten and conceal dark circles. This product really delivered on both counts. I felt like my dark circles were really well concealed and underneath my eye looked smooth and plump where it can often look a little sallow (even with Touche Eclat!). The product itself is a joy to apply, light, blendable and not cakey or drying. It doesn’t sit or seep into fine lines and in terms of longevity it has fantastic staying power, lasting the entire day at work without the need for reapplication. In addition, though the product is designed for the under eye area, I also tried it out on a few minor blemishes on which it worked equally as well as my other concealers. The only down side to this product is the fact it only comes in one shade! Though it works perfectly for pale skin tones, one would imagine there could be some blending issues when used on slightly darker/olive skin tones. All in all this is a fantastic but nevertheless affordable product and if you would like to give it a whirl then you can purchase either online or in store at Boots.